I've been wanting to put a post on here all week, but I haven't been doing any woodwork lately, so although it's a bit different from what you usually see on this blog, I'm going to show you what i've been busy with. As a History teacher I run a Medieval day every year for our year 7s. This will be the third year running and each time I try to make it bigger and better. My plan for this year involves two people dressing up in Medieval armour from the 14th Century. We don't have a huge budget and though we have been able to buy some equipment, I am trying to make what I can. 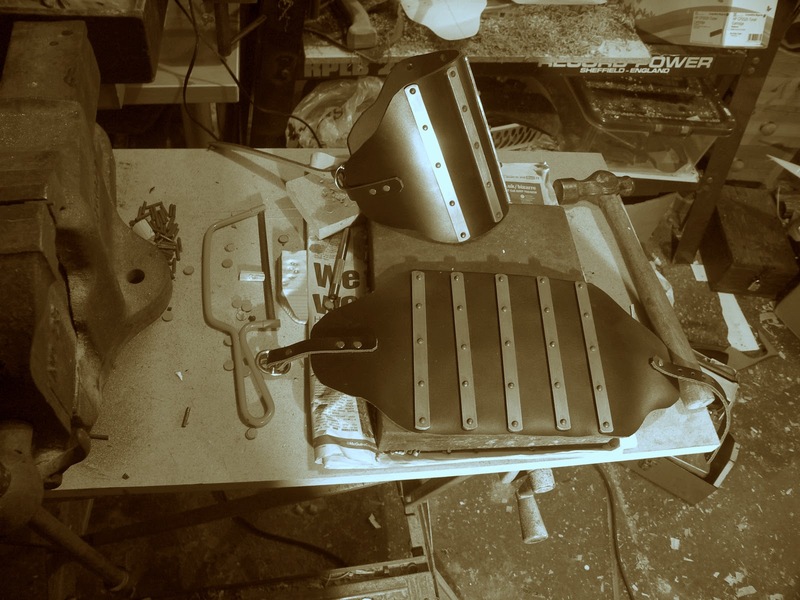 So this week I have been working on some splinted arm armour. I understand that this type of armour was quite common in Europe during the first half of the 14th Century. You can see examples of this in some grave effigies from the period. I've done some leather work in the past, so I thought that this is something I could definitely do, but it has taken quite a while. In total there are 56 rivets that all need to be cut to size and peened over. I'm quite pleased with them, but wish that I'd had some veg tan leather to use. Hopefully they'll look a bit better with some wear. Don't you read the Daily Mail. Teachers don't have holidays to prepare work, you should be sunning yourself in Spain, playing golf, going to militant union meetings or counting how long you've got before you can retire on your £50,000 pa pension. Sorry, rant over, as another teacher who's spent their holidays so far preparing for the summer term rather than carving, you've done an excellent job with the armour. Hope the lessons go well, and that Yr7 appreciate it.